Pinterest can be a bit of a mystery compared to other social media platforms. There are so many things to consider when it comes to growing your business using Pinterest. But one thing trumps all these questions and it's how to design Pinterest graphics that will make people want to click. Because at the end of the day, your ultimate objective with Pinterest is driving traffic back to your website. And if your pin doesn’t entice people to click on it, then all those other fancy tips & tricks won’t matter much. But do not despair, I’m here to help you! Without due, here are solid tips to help you design pins that people will want to click. Before you start reading this post, download the free cheat sheet to help you create great pins now. If you want to learn more about creating irresistible Pinterest images that will make people click, download your free copy of the Pinterest Image Cheat Sheet. * I love and recommend resources in this post, which means it contains affiliate links. For more details, read my disclosure. 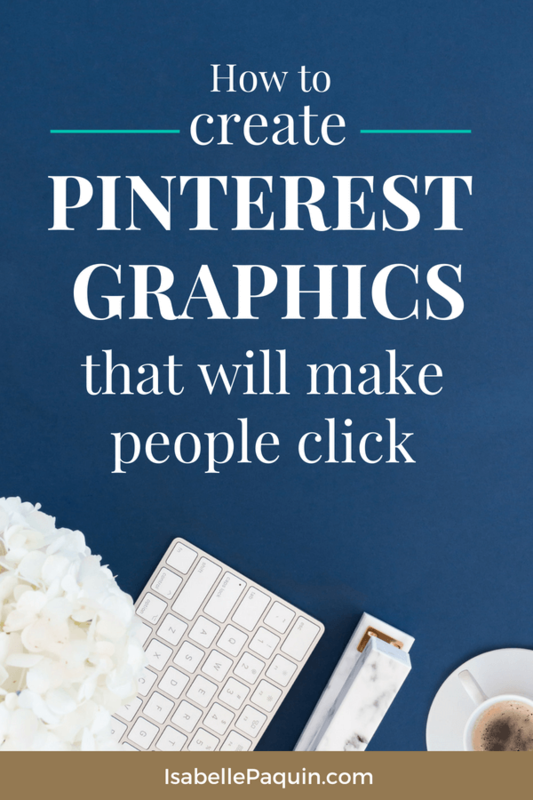 Pinterest Graphic Design: Creating Pins that People Want to Click! Let’s cover them one by one. Pinterest is a visual search engine and as such, image quality is one of the most important aspects to focus on when creating pins. It's what will make your pin stand out in the feed. Take a look through your Pinterest home feed. Which pins stand out? Use this to guide your design process. Select beautiful images that will evoke a positive emotion relevant to your content. It’s what will draw people’s attention. In my business, I like to use on-brand images of desk items and home offices. They evoke a beautiful, inspirational and comfortable work environment for my audience. I used to use free stock photography, but then quickly found out that everybody else was also using the same images. The result? My brand wasn't standing out! So I've since moved to using paid stock photography and I strongly feel this has contributed to helping me stand out online. My favorite resource is Haute Stock as they have gorgeous photography perfect for female entrepreneurs. Here are some examples of their photos (and most of the images on my site are from there too). Because an image doesn’t always tell the full story on its own, it’s best practice to add a text overlay. A good text overlay will draw people’s curiosity and make them stop scrolling to click on your pin. Let's say I had titled this post How to make Pinterest graphics. The likelihood of you clicking on it would have been really low. I mean that title is so boring! By adding “that will make people click” at the end, it tells you the benefit of the post and incites more people to click through. A large proportion of people (about 80%) use mobile to access Pinterest. While your font could look easy to read on your desktop, it might be illegible on mobile. Prioritize fonts that are easy to read. That hand-script font might look super fancy, but if it's hard to read, you can be sure that few will bother clicking on it! Vertical pins perform best on Pinterest. The recommended size is 600px by 900px. While this is not a post about branding, there's much to be said about the importance of consistency in having a successful brand. Having consistency in your pins is part of your success on Pinterest. Think consistency with your colors, image style, watermark, font, placement, etc. It will go a long way in helping your fans recognize your pins in their feed and click through them. I like Canva to design my pins. It’s easy to use and I find it's the perfect design tool for non-designers. While I used the free version for about a year, I've since upgraded to a paid account. Mostly because it allows me to better organize my designs and resize them as needed. There are several great options for Pinterest graphic templates. Of course, you can always design your own pin template like I did. But that takes time. It takes to optimize a template, so that it drives the most clicks. A shortcut is to source templates. Below are 2 options: Canva's free templates or the ones I developed. 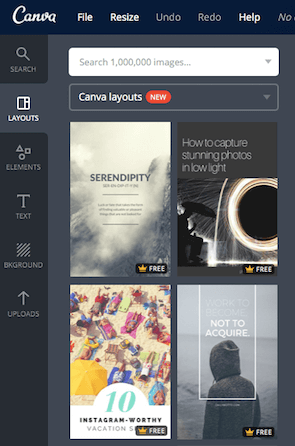 Canva provides you with a series of mostly free templates under “Pinterest graphic”. While some templates are great, there are also a few problematic ones. So when you're going through them, please be careful to select those that match the elements of a successful pin I’ve taught you. For example, the top left layout (pictured below) would not be a good template as the font is too small and barely legible. But the next layout (top right) could be a good option - although I'd increase the font contrast. That being said, these templates are free and can be a good start if that's all you can afford for now. And that's fine too. I’ve spent a year optimizing image templates that drive the most clicks on Pinterest. Students to my program Fab Pin Formula get those and you can sign up here for the waitlist for when the doors reopen. Take the time to create pins that are truly stunning. Your Pinterest graphics are at the core of your success. Apply the best practices I've mentioned above for your image, pin size, text overlay and branding consistency. Developing a Pinterest strategy that works can be complex and sometime intimidating. But with some know-how, you'll soon be generating traffic to your website on auto-pilot. Want to connect with other entrepreneurs that are ready to use Pinterest? Sweet! I've got just the thing for you.